This is something I cooked years ago, before I started What's Cooking Ella, before I started my little food journey with you all. In the cookbook I just wrote a big YUM! on the page. So I finally got around to repeating this dish. It was YUM! all over again. It is very simple to make. What made it even easier to make this time is I chose to bake the osso buco, rather than cook it on the stove top. This ensures, one, I can just put it to bake and forget about it for one and half hours, and two, it will not catch and burn if I don't forget to shake the pot every now and then. So I will give you both methods of cooking this and you chose what is easier for you. When you go to eat this, the meat must be falling off the bone, it will soft and delicious, and the sauce is perfect on mashed potato or some soft polenta. I love the gremolata, but the others in my family don't think it needs it. So it is optional and completely up to you whether you even want to make it. 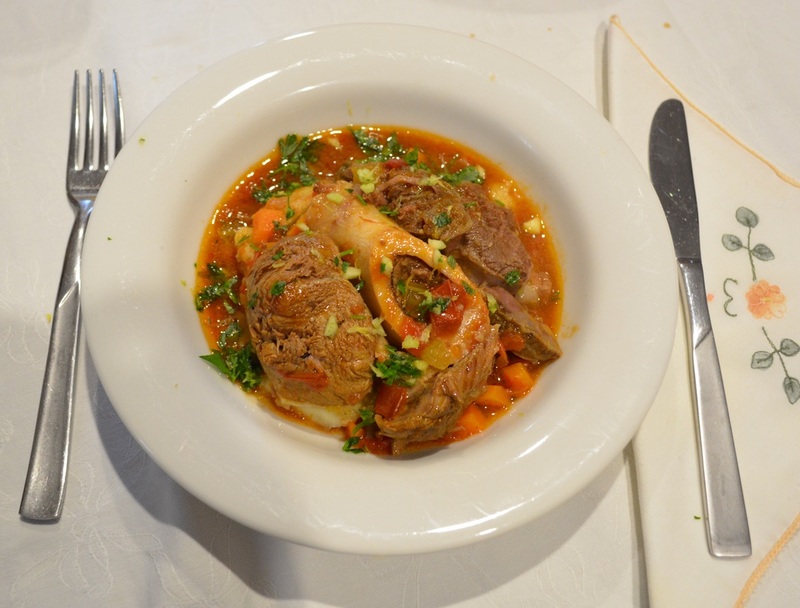 The meat needs to be cut quite thick, you can use veal or beef osso buco. Ask your butcher to cut the veal or beef shin into 3-4cm thick pieces. Also beef is a lot larger than veal so buy the meat according to weight rather than quantity as 12 veal pieces makes about 2.5kg whilst I only bought 8 beef pieces the other day to make the 2.5kg. And finally look at the bone on each piece, if the meat is pre-cut, sometimes the display side of the osso buco looks fabulous, but if you ask the butcher to turn the meat over it will either be the same, or it can be all bone. You want meat on both sides with a small bone. Here is another dish that will not disappoint. Coat the veal in flour, dust off excess flour. Heat the oil in a large flameproof casserole dish; cook the veal, in batches, until browned. Add the butter to the same dish, add the onion, garlic, celery and carrot, cook, stirring, for 5 minutes or until the vegetables have softened. Carefully scrape the base of the dish to release any stuck on bits. Add the tomato paste, cook, stirring for 30 seconds. Add the chopped tomatoes, wine, 250ml beef stock, crushed tomatoes, thyme and parsley. Return the veal to the dish, fitting the pieces upright and tightly together in a single layer. If the liquid has not covered all of the meat, here is where I add the extra 250ml of beef stock, if needed. After it comes to the boil, reduce the heat, simmer, covered for 1 hour and 45 minutes. Shake the pot ever now and then so it does not catch on the bottom. Uncover, simmer a further 30 minutes. After it comes to boil, place covered in the oven and bake it for 1 hour and 45 minutes. Bring to the stove top, uncover, simmer for a further 30 minutes. Remove the veal from the dish, cover to keep warm. Bring the sauce to the boil, boil uncovered, for 10 minutes or until the sauce has thickened slightly. If using, make the gremolata and place in a small bowl. Place the veal back into the sauce to heat up, you want it hot. Divide the veal among serving plates, top with sauce, sprinkle with gremolata (if using). Serve with mashed potato or soft polenta.